THE GM HAS HAD IT. No superpowers. No daiklaives. No ginormous guns. We’re playing GURPS Bunnies and Burrows. You’re all a bunch of freaking rabbits! This is brilliant. And yes, I have occasionally felt this way. 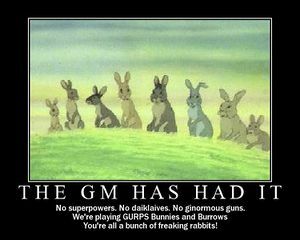 I have no idea who came up with this poster (and unfortunately can’t remember the blog where I first saw it) but I think it’s a sentiment that just about every GM has felt at one point or another, especially when a particularly bad intra-party fight breaks out. For me, the best antidote is to switch gears for a session or two. Rather than forcing people to play rabbits (while I loved Watership Down, I’m not sure my friends feel the same way about it) what we’ve done is broken out the board and card games. Too much inparty squabbling? Play Illuminati and let them get it out of their systems. Need to build group cohesiveness? Break out Arkham Horror and let everyone work as a team to defeat an ancient cosmic evil. Looking for something more non-confrontational? Go with Settlers of Catan or Carcassone. Just need to vent and blow up the world? Sounds like it’s time for some Risk 2210. Of course, board games aren’t for everyone. When we have board game weeks, not everyone shows up, but even then the downtime ends up doing everyone some good.